Mix Design refers to the method of choosing perfect materials of concrete and finding out their proportionate ratios with the purpose of developing concrete with minimum specific strength and stability as reasonable as possible. 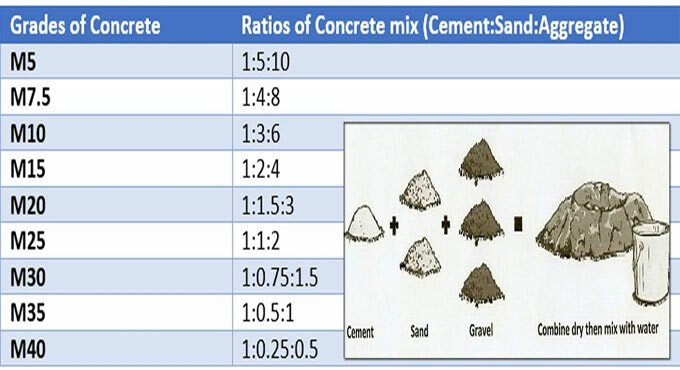 To form concrete maintaining desired strength and properties, choosing of components and their quantity should be determined and it is defined as concrete mix design. Determine whether condition of exposure to concrete is mild, moderately severe or very severe. Exact analysis of soil should be made to determine existence of sulphates & chlorides for any doubt. Type of aggregates – Whether the type of aggregate will be mix graded or 10 mm, 20 mm aggregates should be utilized independently. Testing of concrete – Whether casting & testing of concrete cubes should be performed at construction site on regular basis. Source of aggregate – Whether sources of sand and aggregate are standard or should be altered regularly. Supervision – Whether skilled staffs are there to superintendent concreting work and make require changes like rectification of moisture in sand and alteration in material properties. Site laboratory – Whether the site will contain required laboratory tools like sieves, weighing balance etc. for the verification of material properties.